In 1954, tool and die engineer Lynn Steele faced a dilemma--he couldn’t find parts for his 1931 Cadillac, so he began to make his own parts in his garage, and Steele Rubber Products was born. Now, 50 years later, Steele Rubber Products makes a variety of parts to fit classic cars, trucks and hotrods and continues to utilize Lynn’s proven method of manufacturing the product by hand, using only originals and detailed research. Based in Denver, North Carolina, Steele Rubber’s products include: auto weatherstrip and rubber parts, windshields, doors, windows, hoods, trunk parts and hard-to-find gaskets, pedal pads, fuel systems parts and bumpers. In our business, cost is not the most important factor. Our products are not something that customers necessarily need. They’re something they want. The ability to provide rich information to customers is most important. In the business of hobby vehicle restoration, cost is not the primary selling point when buying replacement parts, but rather the ability to find the product. Therefore, for Steele Rubber, which has maintained a 50-year-legacy of providing these otherwise hard-to-find products, the key to gaining customers is in exposure of its products and product information to customers. The original method of reaching customers and providing this rich, detailed information was through printed catalogs. When Walter Vaughan, VP of IT, began working for Steele Rubber 30 years ago, his goal was to consolidate the company’s vast and frequent product catalog mailings into a more comprehensive, less frequent mailing. And in 1996 with the evolution of the company and the internet, the catalog began to evolve into a homegrown eCommerce shopping cart which Steele Rubber utilized for nearly 20 years. About three years ago, when Steele Rubber realized that the existing eCommerce solution no longer met their needs, the company sought a new eCommerce solution that would synchronize their database of 11,000 products with their SYSPRO ERP, would allow for the use of promo codes, and would still be able to provide robust product information to their customers, maintaining a balance of robust digital product listings and physical catalogs. “Our customers like to browse online, but when it comes to shopping for car parts, they still like to have a printed catalog in their hand to look at,” says Walter. In February of 2013, Steele Rubber adopted Nomad erpCommerce. With the ability to sync information between the Nomad eCommerce shopping cart and Steele Rubber’s SYSPRO ERP, Nomad was not only able to provide Steele Rubber with a modern, state-of-the art platform for its 11,000 products that is easy-to-use, creates promo codes and reduces administration time, but with the ability to easily utilize SEO practices and add products directly to Google Shopping’s product feed, customers can now discover Steele Rubber parts much faster. The use of Nomad has not only enhanced Steele Rubber’s online presence and ability to attract customers, but it has also revolutionized the way that Steele Rubber creates its highly in-demand printed catalogs. 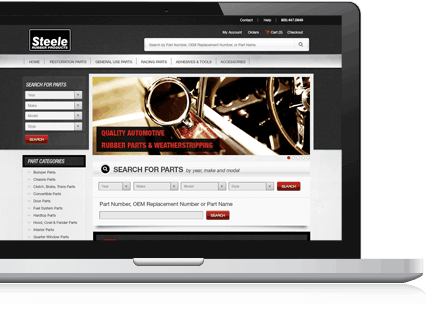 Customers now visit the Steele Rubber website, enter the year, make, model and style of their car, and Nomad pulls product information from the ERP and creates a custom catalog for that customer. This catalog can be viewed digitally or printed and mailed to the customer. Achieving the goal of allowing customers to search for parts online, find Steele Rubber faster in Google searches and receive a better, more relevant, custom-printed catalog, Steele Rubber is now able to set its sights on new goals. With Nomad erpCommerce and the expertise of the Sniperdyne team, Steele Rubber can now focus less time on administering their eCommerce solution and more time on creation. Seamless integration with any ERP: Nomad is able to seamlessly “talk” to Steele Rubber’s SYSPRO ERP software, making it easy to update 11,000+ products without duplicate reentry. Ability to create custom catalogs due to data sync: Thanks to the data sync between Nomad and SYSPRO ERP, Steele Rubber customers can go to www.steelerubber.com, enter the year, make, model and style of their cars and receive a digital or printed custom catalog. Optimized for search engine optimization (SEO): With the guidance of the Sniperdyne team, implementing organic SEO strategy is easy, and Steele Rubber products now appear at the top of customers’ search results. Optimized for complex pricing situations: Nomad allows Steele Rubber to create promo codes and complex product, pricing and discount options with ease. Less development work for IT: Steele Rubber used its own homegrown eCommerce shopping cart for nearly 20 years. With Nomad, Steele Rubber no longer has to handle development or changes in-house.